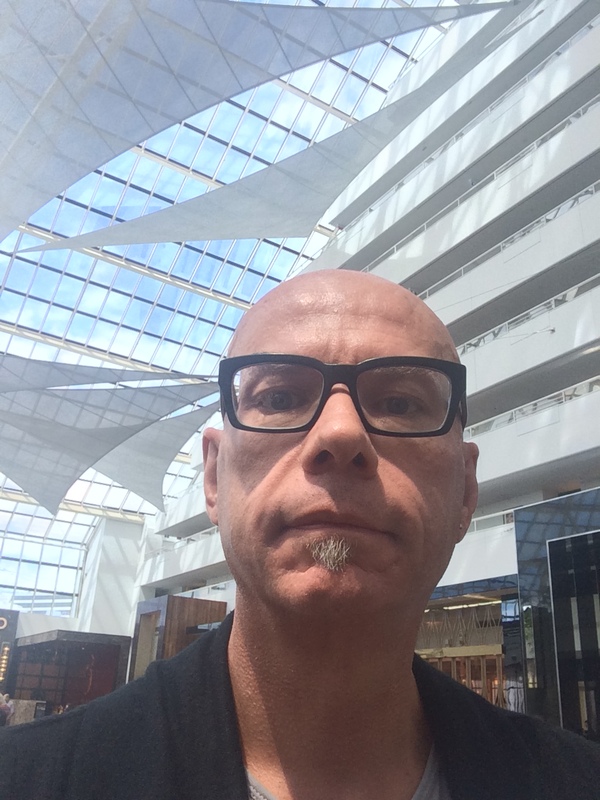 I had the good fortune to be taken out to lunch on Friday to Bistro Guillaume at Crown Perth and what a delight it was. Other than the great company and the chance to sit back on a Friday afternoon and enjoy the company the setting, the service and above all that the food were simply sensational. This is the second Bistro Guillaume in Australia that features the stunning food of acclaimed chef Guillaume Brahimi. This was my first foray into Bistro Guillaume since it was taken over. I was a huge fan of Allure (its previous incarnation) and so was not sure what to expect this time. But from the moment we arrived I realised that I was on for a treat! The setting is absolutely delightful – it is gorgeously decorated and the feeling is light, airy, well appointed and relaxing. It creates a really fresh ambience with the light colour palette that is used and with the windows overlooking the Crown pool area it has so much light streaming in that adds a wonderful vista for a relaxing lunch. Having trained and worked in my early life in traditional French cooking in Melbourne I was excited to see some classic French bistro items on the menu such as chicken liver parfait, twice cooked cheese soufflé and escargot. Sitting along side this were other favourites of mine such as traditional onion soup and a classic country style terrine which I just had to sample. This really is traditional French cuisine at its best. With fresh ingredients and simple presentation all combining to create dishes that look and taste sensational. For me it was always going to be either the parfait or the terrine to begin with and so it was the terrine the finally won out. My lunch companions chose the onion soup and for something a little left of field in a French bistro had the tempura prawns served with soy and yuzu flakes. Each of the dishes arrived at the table with a flourish and I really loved that each of the waiters in attendance were all French. It just added yet another dimension to the experience! We all enjoyed our entrees and for me the country terrine was perfectly prepared and presented with some toasted baguette and small pickled cucumbers to complete the dish. The rich flavour of the terrine was pure delight with the subtle meats combining to create a delightful texture and having it served on top of a spread of French mustard just gave an added complexity to the flavours. 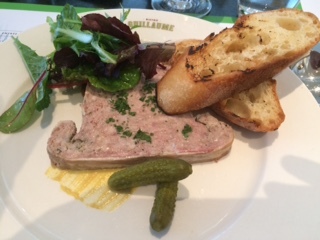 Country style terrine – the perfect start to lunch! 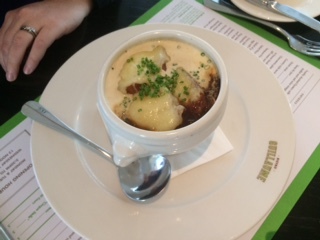 My companions dishes were also well received with the onion soup being thick, flavoursome and a real treat! It is very hard to do onion soup wrong but I have had a couple of experiences where it has been served incorrectly and the onion has been really inedible in the soup but this was not the case here! It was obviously freshly made and the flavours all worked together to create a perfect onion soup. Traditional onion soup – a real delight. The prawn tempura was hot, well presented and really tasty. It was presented simply and with a real sense of panache. 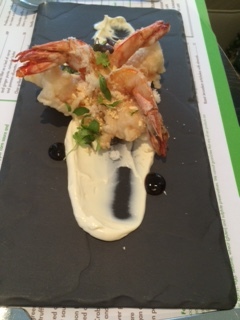 Tempura prawns – with a French connection. After the hustle and bustle around Crown, Bistro Guillaume is an oasis of elegant simplicity and refinement. It reminded me of some of the delightful bistros that I had wandered into when I was in the Marais district in Paris! The main courses then arrived and again we were all delighted with what we chose. 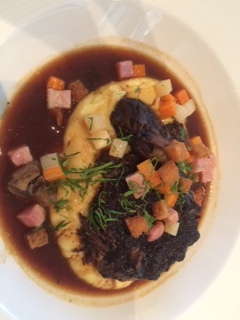 Two of us went for the Beef Daube in red wine sauce on a bed of Paris mash which was just sensational! It was melt in your mouth beef that was further enhanced by the delightful red wine sauce and the Paris mash was a nice simple accompaniment for it. 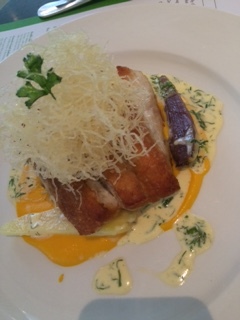 My other lunchtime companion chose to have the Barramundi fillet on a bed of carrot and ginger purée, coriander butter and pommes allumettes. This was again presented wonderfully and looked impressive. She enjoyed every last morsel of this dish and loved the succulent freshness of the Barramundi. As a side dish with our main courses we chose to share the Watercress salad with endive, pear, Roquefort and walnut vinaigrette. We had the Roquefort cheese served on the side so that we could mix in as little or as much of it as each of us wanted to. This was a fresh, clean, delightful salad that really complimented both of the main courses that had been ordered. 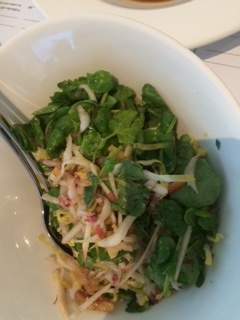 Watercress salad with endive and pear – delicious! We all chose not to have dessert as we were all well and truly full from our first two courses, even though I was tempted by the Apple and Rhubarb crumble with rum and raisin ice cream or the Chocolate soufflé with cherry ripple ice cream which I had been told were both amazing and perhaps will try on my next visit. Bistro Guillaume is really a delightful dining option amongst the many that are now on offer at Crown and if you are looking for a refined, elegant dining experience with first class service and amazing French food then this is the place to head to! I would highly recommend it and am looking forward to heading back for dinner real soon. Getting ready to head into Bistro Guillaume!